The USN's Essex class carriers were arguably the weapon that turned the tide in the Pacific war. They were essentially enlarged Yorktowns weighing in at 33,000 tons full load. There were no new major innovations in this class, just the pinnacle of a carrier operating piston-engine aircraft and above all, a total of 24 units were completed. This made them the largest class of aircraft carriers ever built. Upon arriving in the Pacific theater, the carriers delivered on their promising potential. When used in large fast carrier task forces, they proved devastating when pitched against Japanese forces. The air group, or "Sunday Punch", consisted of 4 squadrons of 18 planes and one squadron in spares totaling 90 aircraft. The designers had gone for active defense, providing enough air power to deal with aerial threats and any that got through would have to deal with a formidable AA barrage. This initially comprised 12 x 5in/38, 44 x 40mm and 44 x 20mm but was greatly enhanced as the war went on. The weakness of the Essex class was the vulnerability when "one got through" and delivered an attack on the ship. 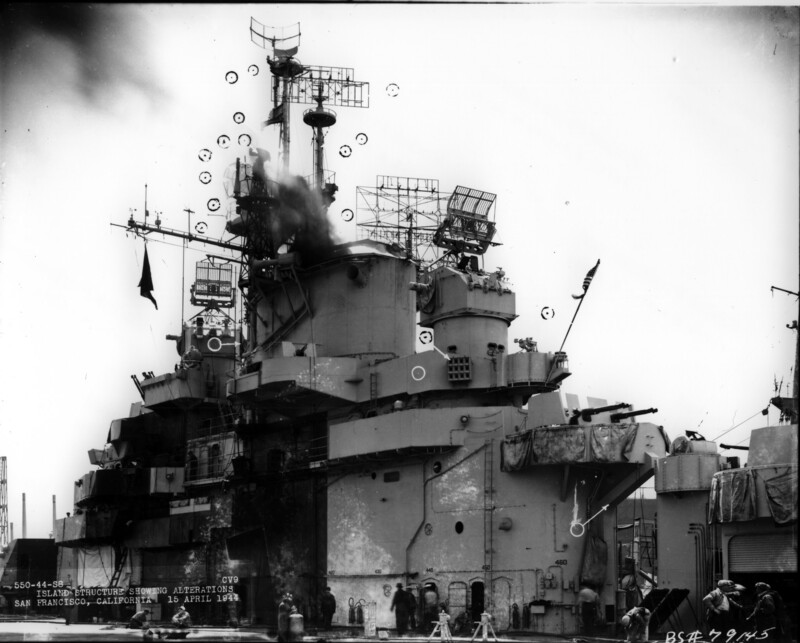 Not having an armored flight deck meant that bombs penetrated into the hangar deck where planes were refueling and rearming and could set off crippling fires and explosions. This happened most severely in CV-13 FRANKLIN and CV-17 BUNKER HILL where over 1000 men were killed due to the resulting fires. Despite the considerable damage sustained, both ships made it back to the US under their own steam and were rebuilt. This is CV-9 ESSEX as she joined Task Force 14 as flagship in August 1943. She was commissioned in December 1942 after a build time of just 14 months. This haste was obviously due to the severe losses being sustained by the US carrier fleet in 1942. As a result, Essex was commissioned without flight deck or hangar deck catapults. The flight deck catapults were installed in a refit in March 1944 at Hunter's Point, CA. She took part in most of the island-hopping Pacific campaigns and was hit by a Kamikaze in November 1944. The camouflage is Measure 21 and the flight deck is painted in #21 Flight Deck stain, which when newly applied, was identical to 5-0 Ocean Grey. I'm planing on doing the early units of this class, the "long bow" units and, time permitting, the SCB conversions. Last edited by Charybdis on February 23rd, 2018, 1:18 pm, edited 6 times in total. Wooow! Fantastic! Looking forward for more! only one minor remark: I would think that the skeg and rudder be painted the same way, both non-shaded, right? Excellent work Charybdis. Fills a large hole that has been in the US Navy lists for some time. These have been missing for quite a while... a dream of mine was to draw the "Murderer's Row" lineup from the famous Ulithi photo in December of 44, but I think you'll probably beat me to it. So, so nice to see all the small parts I've so painstakingly researched and drawn being used by someone else, and correctly to boot. 1. The SG radar should be colored with the same 5-N navy blue as the rest of the ship. 2. Only the 36" searchlight lens should be the standard plain grey - the rest of the SL should be painted to match the ship. 3. Even after the 1944 refit, CV-9's Mark 37 directors retained Mark 4 radars - it looks like you've used the Mark 12/22 versions. 4. Somehow the old 5"/38 twin mounts got used in this drawing... I really should just delete every Bad Old drawing of mine that has them. They are insidious. Navweaps shows the CV-9 class mounting the Mark 32 twin mounts. Use this version of that mount. None of this detracts from a really, really great drawing. As some of our esteemed members often say, "AWESOME WORK!" Sources and documentations are the most welcome. A long time in coming, but well worth the wait! Thanks very much for the positive feedback. Thanks very much for this. I have changed all of your recommendations. Thanks also for the use of your parts. The drawing wouldn't be half as good without them. I hope to get a few more of the early units up soon. Really looking forward to seeing some of the early units!